After SNA-K’s Narok Chapter successfully implemented an educational forum to address land issues in Narok at a key hot spot for conflict, Kibilat, we received positive feedback and requests for replication from individuals all over Narok. 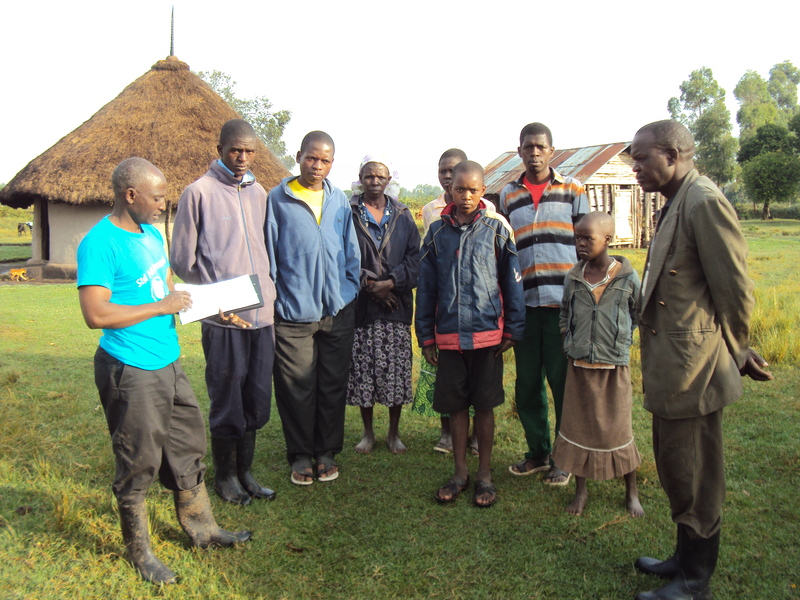 People felt that the forum helped them to understand key information about land issues. Specifically, the forum helped participants understand double leasing, a phenomenon in which two individuals are sold the same plot of land. Often, individuals believe others are grabbing their land when there is really double leasing (individuals have been sold the same plot of land, and often both have been tricked by a third party). This causes a great deal of conflict in the area, especially when rumors spread about specific instances of double leasing but exaggerate conflict between individuals into conflict between ethnic communities. After the positive response from the initial forum, SNA-K sought support to replicate this forum in other parts of Narok, and to implement similar forums to address the relationship between the spread of rumors and conflict. In mid-February, SNA-K officially received support from USAID-OTI to implement this project, complete with new elements of extensive research on land issues throughout Narok, focus groups with key community leaders to create conflict-monitoring mechanisms using SMS, and a radio programs element. The project has begun with three weeks of research conducted by ten local researchers in Narok North, Narok South, and Transmara. The researchers have interviewed stakeholders ranging from government land administration institutions, to individuals using these institutions, to local conflict resolution mechanisms and community elders. This research will inform a series of grassroots forums focused on double leasing and rumors. The format of open-air forums provide a space for community members to come together in a safe space across ethnic lines to discuss the issues that affect them in a moderated format and in the presence of experts on the subjects that they discuss. By combining local perspectives and airing of issues with legal and educational information, SNA-K takes dialogue a step further by enabling community members to take next steps in addressing their issues. A total of twelve forums will be held, six each on double leasing and rumor monitoring. Forums on double leasing will be held in Mulot, Ololulunga, Nkareta, Noroosura, Transmara, and Mau- Tipis. Forums on rumors will be held in London (Narok Town), Majengo (Narok Town), Ololulunga Town, Mulot Center, Olmekeinyu (Mau Forest Area), and Sogoo. Rumor forums will be planned to coincide with market days and to happen near to market places to have the largest audiences possible. After these forums, SNA-K will hold focus groups with key community stakeholders to design a conflict monitoring mechanisms based on information gathered about land conflict and rumors. SNA-K will also work with community radio stations to have two shows discussing the most important issues that came up in forums, and will invite guest speakers to discuss how good leadership and policies can help address these issues. Read the 3-page concept note on this program here! SNA-K’s Narok team recently held an evaluation meeting to discuss successes and challenges of the Kibilat forum on double leasing. All members agreed that the meeting went very well, with high attendance of over 90 individuals despite heavy rains and difficulty in travel. The participants were very active, making the forum extremely interactive. The team concluded that SMS, posters, and radio were highly effective in advertising for the forum, but suggested that outreach on SNA-K in new areas would be crucial, as many individuals in attendance at the forum requested that SNA-K conduct outreach in their areas. The chapter members pointed out that one of the most important parts of the forum was that both sides of the conflict were represented, and specific people and groups who have fought one another over land in the recent past were in attendance. Initially, these individuals asked pointed questions, attempting to prove one another to be in the wrong, but the team and the lawyer handled these questions by pointing to the procedures and lack of knowledge as the root cause of the issue. By the end of the forum, participants stood up to testify to their realizations that, in the words of a chapter leader, “everyone was in the wrong because no one was following proper procedures.” These testimonies mainly spoke to the lack of benefit from violence, and the need for everyone to follow the correct procedures. Many participants asked SNA-K to repeat the forum, stating that the forum and the information it presents are very important for the maintenance of peace. Individuals also said they realized that they only lose by fighting, and one participant went so far as to explain that people do not invest properly because there is no real peace, thus everyone loses economically. At the end of the meeting, many individuals in attendance, including local government officials, requested that SNA-K hold similar forums in their areas to address the lack of knowledge on how to acquire land. Many told chapter leadership that they realized they were fighting for nothing and that their communities needed to be educated on the same. The team will now work to conduct outreach in new areas to which they have been invited, and to replicate this forum in other areas.